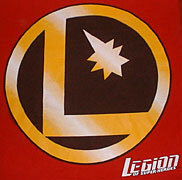 This shirt was designed to emulate the Legion staff jackets worn in the comic books by Chuck Taine and others. The manufacturer of the physical shirt (as opposed to the printer of the design) is Gildan. In late 1998, the alien race formerly known as the GilDishpan was used in the postboot continuity for the first time, and dubbed the GilDan. The timing of this shirts release is such that there could be a direct influence.